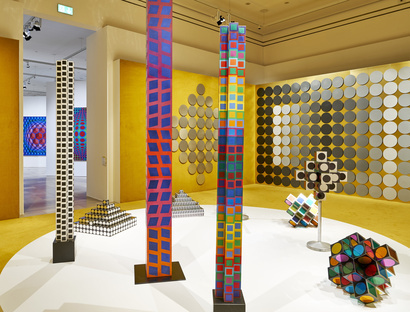 If your planning on a visit to Frankfurt in Germany over the Christmas break, we really recommend a visit to the delightful Städel Museum to see the exhibition Victor Vasarely. 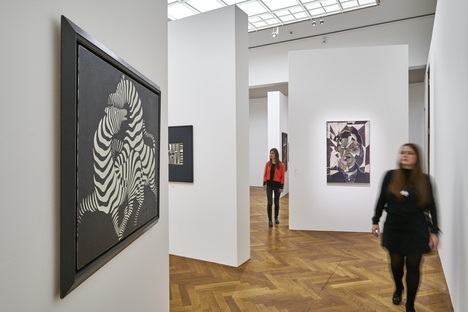 If your planning on a visit to Frankfurt in Germany over the Christmas break, we really recommend a visit to the delightful Städel Museum to see the exhibition Victor Vasarely. In the Labyrinth of Modernism. 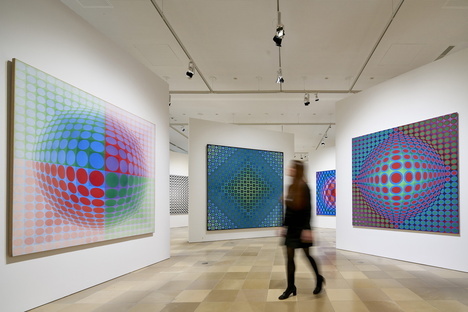 A major retrospective on the inventor of Op Art in the Sixties showcasing about a hundred of his works. 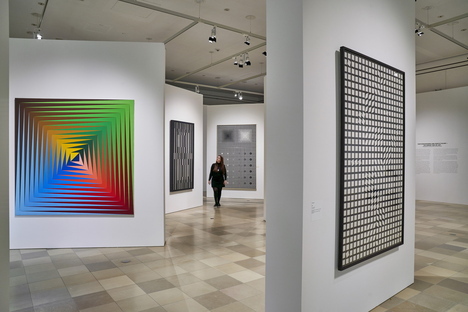 The diversified work of Victor Vasarely (1906-1997) is more relevant than ever: he anticipated the aesthetics of video games using the visual effects generated by today's computers. The vivid colours of his rigorously geometric patterns are still a part of contemporary design – as are the strong contrasts of his black-and-white painting. This omnipresence is also due to his reproduction techniques and the application of his ideas in everyday life, so that his art ultimately gained ground throughout our visual world and, to this day, plays its part in shaping our perspective. The Hungarian-born, French artist trained, took inspiration and orientation from early modernism, making the basic idea of the Bauhaus “unity of art, life and craftsmanship” his guiding principle, but also drawing on Suprematism and geometric abstraction. And we mustn't forget his professional origins either: he had studied economics and advertising and, after leaving Hungary due to the political situation, he emigrated to Paris, where he worked as a graphic designer in advertising. His day job involved finding optical effects that would have an impact on the viewer. He quickly learned how perception reacts to patterns and structures that deform and change, and what effect strong light-dark contrasts have on the beholder. He continued his exploration and also encompassed aspects like deconstruction and movement that the Futurists focused on. From his exploration of the styles prevalent in early modern art, Vasarely developed his own optical vocabulary for which he is known to us still. Abstract painting works with the simplification or re-forming of real objects. Vasarely took this process a step further, conceptually speaking: more and more frequently, perception and the visual process themselves were the themes of his painting and he went on to place the visual experience at the centre of his works. He then arrived at kinetic art, working with movements that were only perceptible when the viewer moved. Then if the forms of regular structures are changed, they take on the appearance of spatial volume. It is no longer possible to perceive them as flat. Vasarely took this idea to the absolute limit of visual comfort, then, with the addition of colour, he introduced Op Art. 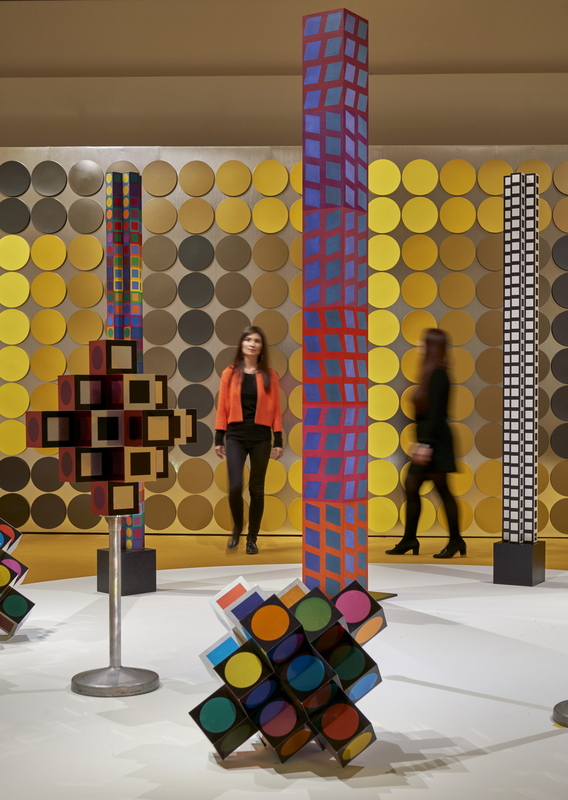 The complete retrospective of Vasarely is a rediscovery of an artist who was a central figure in the 20th century, reflecting modernity in all its complexity like no other. 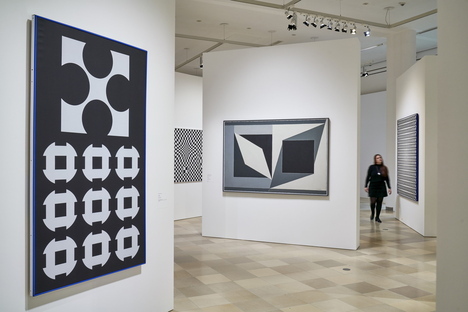 Through the more than 100 works on display at the Städel Museum, including his interior designs made with his son, visitors can look back over an artistic career spanning more than 60 years and learn that Vasarely has given us much more than Op Art. In some ways, he anticipated the Visual Literacy studies with his most important artistic invention: his “plastic alphabet” (patented in 1959) where, like the letters of the alphabet, the “plastic units” open up virtually infinite combinatory possibilities for the creation of artworks, encouraging people to make their own art. Lessons that are more important now than ever in a society dominated by images that most people cannot interpret or even handle with care.